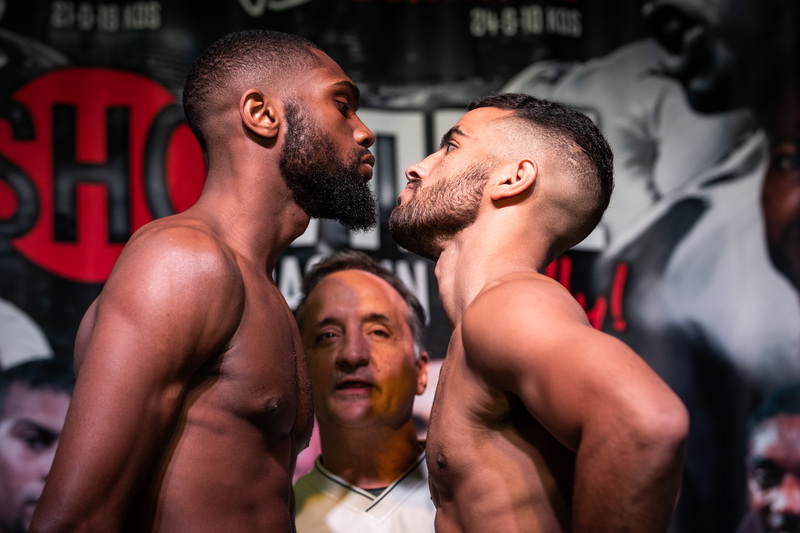 PHILADELPHIA (November 15, 2018) – One of boxing’s top prospects, undefeated Welterweight Jaron Ennis and veteran Raymond Serrano made weight just a day before their ShoBox: The New Generation 10-round main event that headlines a tripleheader live on SHOWTIME (9:35 p.m. ET/PT) from 2300 Arena in Philadelphia. The 21-year-old Ennis (21-0, 19 KOs) returns for his second ShoBox challenge of 2018 against Serrano (24-5, 10 KOs) in a battle of Philadelphia fighters facing off in their hometown. The three-fight telecast features five ShoBox veterans and three fighters who call Philadelphia home. In the co-feature, a pair of ShoBox veterans meet when Chicago’s Kenneth Sims Jr. (13-1-1, 4 KOs) takes on Philadelphia’s Samuel Teah (14-2-1, 7 KOs) in an eight-round Super Lightweight bout. Also on the card, undefeated Ukrainian Arnold Khegai (13-0-1, 9 KOs) faces New Jersey’s Jorge Diaz (19-5-1, 10 KOs) in an eight-round super bantamweight bout. Tickets for the show, which is promoted by Victory Promotions in association with Hard Hitting Promotions, are priced $50, $75 and $125 and can be purchased at 2300arena.com and hardhittingpromotions.com. ** NOTE: Referees and judges for the three televised fights have yet to be determined. “I’m really looking forward to fighting in front of my hometown fans. There is going to be a packed-house and I’m so excited for this fight. Some fighters don’t like the pressure of fighting in front of their own people, but I can’t wait to show out. I will definitely have no trouble getting up for this fight. “A Philly fighter is a different kind of fighter. A Philly fighter is going to bring it to you and show off their abilities. I feel like we are the best fighters. There’s a lot of pride in being from here. I get to put on for Philly and show SHOWTIME and the world my talents. Philly fighters always come to fight. “I don’t know too much about Serrano. I never worry about my opponent or watch tape or anything. We don’t prepare for one guy, we mix it up in the gym because you never know how the guy is going to fight on fight night. We prepare for everything. “He thinks he has more experience than me. No, he doesn’t. I grew up in this sport. I’ve been in the gym since I was in a jumper. I’ve seen it all. I got to see my brothers fight growing up. I’ve sparred pros since I was 12-years-old. They always say I don’t have the experience and I’ve never fought anybody. We’ll see. There’s nothing this guy can do. “I’m just going to keep winning and knocking guys out until I get to the point where I can fight a contender. I’m ready right now, but I know I have to be patient. I’m only 21-years-old, so I have time but we’re ready right now. “Right now, I feel like I’m in a position where I can compete against any of the top guys. I fought Alex Saucedo, and honestly, I thought I won that fight. I believe after that fight, it took me to another level. My confidence grew and I knew that I could compete with anybody. “I feel comfortable going forward and putting pressure on. If I have to box, I can box too. I feel comfortable being on the inside now, and it hasn’t always been that way. “I’ve been in the position where I’ve been fighting undefeated guys. Everybody is against me but I love that. He’s the one with all the pressure, he has to prove that he’s as good as everybody says he is. He’s never seen anybody like me. Everybody he’s fought recently, I beat them years ago. “Ennis looks good. He’s a strong fighter that’s coming to fight but so will I. I think this will be a good fight. My last fight, I was fighting the best fight of my career before it had to be stopped. I went into [Gerome] Quigley’s hometown and I was winning that fight. “There’s going to be a lot of people in the crowd that want to see me lose. Ennis is the hot prospect with all the fans, but I think I may switch some people’s opinion. Beating Ennis will put me in the position to fight anybody. “I’m really disappointed to be 1-1-1- on ShoBox. I feel like I should be 2-1, I should have won the fight I drew. But I do think the loss was a really good learning experience, and I needed it. It really helped me learn more about myself and what I need to do better. There’s always more to learn. “I need to get physically stronger. I’m working on my strength and conditioning right now. When I fought Montana [Love], I only had been training with my new strength and conditioning coach for three weeks. Now, I’ve had the full camp with him. I’m learning more about my body and how important rest is and not to just always push myself too hard. “When I transitioned to being a pro, I really needed to learn how to relax. When I first fought on TV, I put so much pressure on myself to perform and there was a lot of expectations. “Every fight is a fight that I need to impress in. Every fight, I want to show something different. I’m known for my speed, but I feel like I haven’t shown all of my skills on ShoBox yet. “I feel like Teah is going to try to press me. I don’t think he’s going to realize how strong I really am. I just want to make him work, and I don’t want to give him any down time. I don’t want to let him rest. “I just really like fighting. When I was younger, my dad had to remind me that I’m a boxer, and I’m good at boxing. But I couldn’t help it, I just wanted to fight. Now, I’ve realized that I need to be a boxer. “I’m always active. Even when I’m not training, I stay in the gym and I spar once a week. Training in Houston has been great, being around other professionals that are trying to do the same thing as me is great for my development. I train with O’Shaquie Foster, we’ve known each other since we were little and we really push each other in the gym. “I was under the weather my last fight. I don’t want to make excuses, but my inactivity lost that fight not what he did. I was fighting very conservatively, instead of just putting everything on the line. I was too worried about tiring myself out and that was one of the key factors in deciding that fight. I’m one hundred percent for this fight and it will be a different story. “I feel like this is my biggest stage yet. I’ve fought in Vegas, but this is as big as it gets for me. Everybody that knows me and has followed my career will either be here at the arena or watching on TV. “I watched him fight live once here in Philadelphia. I’ve seen him box and I’ve seen him brawl and try to be the matador. He’s a great fighter, he’s very versatile. I don’t think he has great power, but he can box. I think his stamina might be an issue. He works at a very high rate, but I know he can’t keep that pace for the entire fight. The pace will drop after a couple rounds, and then it will become a more technical fight. “I was nervous my first fight on ShoBox, but all the nerves are gone, this time I’m going to show what I’m really about. “In my last fight, I just wanted to show that I could outbox somebody in America. That’s what I did, and now I’m really going to show what I’m all about. “It’s a totally different level in the U.S. The fighters are much stronger than in Moscow. It’s also much more professional with all of the medical treatment and the facilities. I think it will help me that I’ve already fought here in the U.S., I know exactly what to expect and I know what the atmosphere will be like. “I only know that Diaz fought Adam Lopez, the same opponent that I had. I’ve watched him a little bit, and I see this as a war. I think we’re going to brawl with each other, and it will be a really interesting fight. “I haven’t fought in a year, but I’ll be as sharp as I’ve ever been tomorrow night. I’ve been in the gym training non-stop, and I’ve gotten my nutrition and my training right. We’ve been very rigorous with our nutrition, in terms of what we put in our body. I’m ready to go. “I used to be just a fighter. I didn’t know about the Sweet Science of boxing and about what separates the good boxers from the great ones: rhythm, distance and timing. It’s not about who runs the fastest, otherwise lions and tigers would be running the world. It’s about your intelligence. And that’s what I needed to learn and what I have finally figured out. “Arnold [Khegai] is in over his head. I’ve watched tape. He’s a basic fighter. He comes forward. He doesn’t know how to box moving backwards. He doesn’t know anything about rhythm, distance and timing. We’re going to outbox him, but it’s going to look aggressive.